No gantry remains, but a Juno I rocket is in place on the launch pad. The Juno I rocket was the vehicle used to launch the first Explorer satellites (including Explorer 1, America's first satellite). Directly north of us is Complex 26. The Juno I is essentially a Redstone rocket with a modified first stage (called a Jupiter-C) and three added upper stages. Where the original Redstone used alcohol and water as fuel in the first stage, the Jupiter-C used Hydyne (a mixture of unsymetrical dimethylhydrazine and diethyltriamine). The net effect was to boost the first stage thrust from 75,000 lbs. to 83,000 lbs. Three added upper stages gave additional thrust. Note that the Juno I rocket is also referred to as a Jupiter-C. 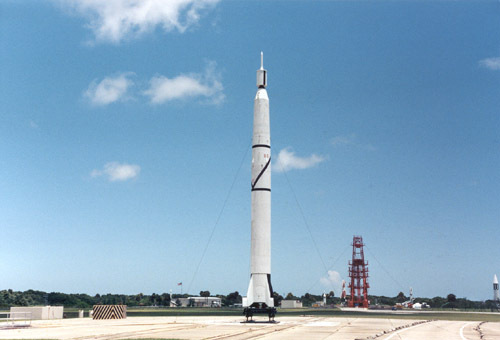 In the picture above, note the cylindrical section just below the top of the rocket. This is called the "tub". The tub was electrically rotated to spin-stabilize a payload when it was released. Length 71.25 ft. Diameter 70 in. 1 Jupiter-C 1 Rocketdyne A-7 LOX, Hydyne 83,000 lbs. 2 Sergeant 11 Thiokol Sergeant Solid 16,500 lbs. 3 Sergeant 3 Thiokol Sergeant Solid 5,400 lbs. 4 Sergeant 1 Thiokol Sergeant Solid 1,500 lbs.